Note: The Nintendo DS only works with a Hub that has WEP security (or no security). The black BT Home Hub 2.0 has WPA security, so you may need to change it. How do I change the wireless security on my BT Home Hub 2.0 to WEP? 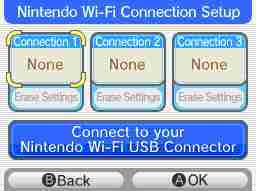 Insert a Wi-Fi compatible game into your Nintendo DS and access the Nintendo Wi-Fi Connection Set-up screen. For information on how to do this please see your game manual. 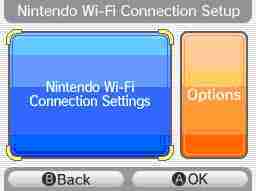 Select Nintendo Wi-Fi Connection Settings. You will be presented with a list of access points (BT Home Hubs or routers) within range of your Nintendo DS. If your access point has a blue unlocked icon select this option and then OK. The Nintendo DS will establish a connection with the BT Home Hub or router. Back out of the set-up screens back to your game. If your access point has a red locked icon, select this option. Enter your wireless key on the following screen then select OK. Tap OK to save these settings. Tap OK again and the Nintendo DS will establish a connection with the BT Home Hub or router. Back out of the set-up screens back to your game. 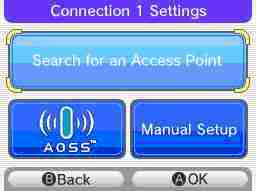 If your access point has a grey locked icon then the Nintendo DS is not compatible with the security settings on your BT Home Hub or router.